"Death is no more than passing from one room into another." 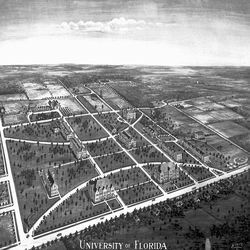 If you are interested in ghost adventures and haunted places in Florida, you may be interested in learning the paranormal stories of the University of Florida – home to the Florida Gators sports teams. There are many mysterious stories, legends, and other tales that surround this large and immensely popular college in Gainesville, Florida. Many students, professors, and other individuals that interact in and around this college from both the past and the present have several stories surrounding events and rumors that seem to surround the spiritual world. In this ghost adventures guide to haunted places in Florida, you will learn of the reported hauntings that are said to occur here. The first haunted location that is part of the University of Florida campus is the area where the College of Law is located. It has been established that this section of the popular college was constructed over the grounds of a burial ground that the Native Americans created. It is believed that when the construction on this section of the college began that the spirits that were laid to rest on the grounds were seemingly awakened – in a spiritual sense of course. Now, it is believed that the old chiefs and other Indians haunt the structure as well of the grounds of this region. Many unexplained events have taken place in this section of the college according to guests, students, and personnel as well. The area of this college that serves as a home for the Florida Gators that serves as the College of Education is also apparently haunted. The building is known as Norman Hall. In the 1930s this area served as a school for grades K-12. It was during this time that there was an accident involving the elevator located within the structure. A young girl is said to have died when the accident occurred. Today, there have been countless stories involving what seems to be the spirit of a little girl. Many claim that they have actually seen the apparition of the girl. There are others who have felt a strong cold breeze go by them and still others who have heard what appears to be a child laughing and playing. In the area known as Thomas Hall, a ghost by the name of Steve is said to haunt the building. In the earlier days of this Florida Gators building, there was a cafeteria. A cook by the name of Steve worked there and was popular among the students. One day, Steve died and it affected the students that he was close to immensely. Soon after his death, students began to hear sounds that resembled that of pans or pots being banged together. Many believe these sounds were emitted from the heating radiators in the building, but there are many who believe that these sounds are caused by Steve engaging in on campus ghost adventures. If you have an interest in, haunted places in Florida, are a fan of the Florida Gators, attend the University of Florida, or are seeking out the local hot spots for your own ghost adventures, you are sure to enjoy hearing the ghostly tales at this Florida college campus. If you have time, you could even swing by the hospital where many students learn to become doctors. This hospital is called Shands at the University of Florida. According to the students, doctors, and many patients that frequent this structure, this is a haunted hospital where many unusual events occur. Gainesville, Florida is a wonderful place for many different ghost adventures.